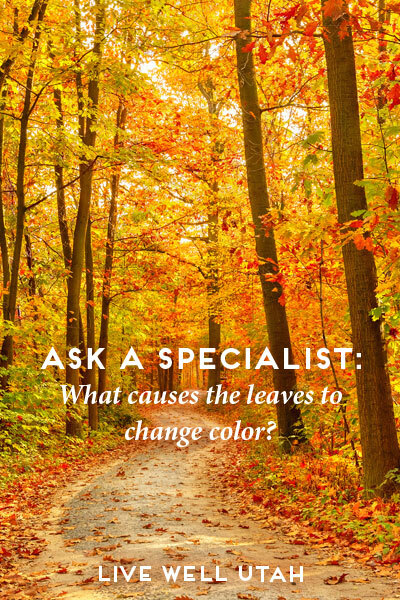 Ask a Specialist: What Causes the Leaves to Change Color? Answer by: JayDee Gunnell, Utah State University Extension horticulture associate professor, with information from the USDA Forest Service article. Once again the summer season comes to an end and crisp autumn days are upon us. Temperatures drop, the days get shorter and vibrant colors quickly spread across the mountains and valleys as trees prepare for long nights and frosty temperatures. The striking colors range from yellow to orange, hot pink to scarlet red and even purple hues. Color pigments found in leaves differ among plant species and can vary from year to year. Colors are most vibrant when plants have had adequate moisture throughout the season followed by sunny autumn days and accompanying cool nighttime temperatures. However, the internal trigger that causes leaves to change color is the shortened day length. When days become shorter and nights become longer, a process within the plant causes the cells around the base of the leaf, or petiole, to divide rapidly but not elongate. This process forms an abscission layer where the leaf will eventually separate. This abscission layer blocks or prevents sugars from escaping the leaves. During the growing season, leaves are working constantly to produce sugars via photosynthesis, which is the conversion of light to energy. These sugars are shipped throughout the plant for growth and storage. It is during this active production time that the vibrant green colors are dominant. Chlorophyll (the green pigment) is found in nearly all plants and is a key component in photosynthesis. It breaks down readily in sunlight and is replaced constantly throughout the growing season. Consider the following information. Carotenoids and xanthophylls (the orange or yellow pigments) also aid in photosynthesis and are produced throughout the season but are masked by the “green machine” of chlorophyll production. However, when photosynthesis slows and chlorophyll breaks down, the “hidden” orange and yellow pigments become more apparent and fade at a much slower rate. Quaking aspen, ginkgo, Norway maple, ash, birch and honey locust are a few examples of trees containing these pigments. Anthocyanin (the pink, red or purple pigment) can vary from year to year. Anthocyanin is produced primarily in the fall and is found in species such as certain maples (like our native Bigtooth maple), burning bush, flowering pear, sumac and dogwood. The determining factors influencing the production of these pigments are the amount of sunny days and cool (but not freezing) nights. Tannin (the boring brown pigment) is the last pigment to break down in a leaf before it falls. Oaks or other non-showy species, notorious for having leaves containing tannin, are the final reminder that winter doldrums are soon to follow. Take a moment to get outside and enjoy the stunning color of these leaves while they last…before they bring on the ominous chore of raking.